is a photographer whom I am delighted to call a friend. We met at Six Flags Great America in Gurnee, Illinois, where she was, in effect, my bodyguard. (The details of that relationship will have to be the subject of another post.) I recently caught up with her and asked her about her passion. Where did you grow up? Does that influence your work? I grew up in Waukegan, Illinois. 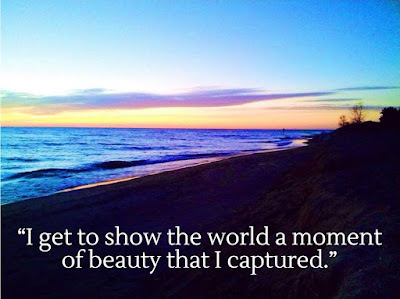 I was always moving and I am in love with Waukegan Beach and downtown Waukegan. Just the thought of how it used to be so special and a place worth visiting. I wouldn't say it influenced me but [it] got me thinking. I have always been into art in general. I played piano, I painted; but [there] was something so fascinating about going through old albums – actual picture albums, not digital – seeing pictures captured on a simple piece of paper. A picture that captured a beautiful moment, a funny moment that really caught my attention. 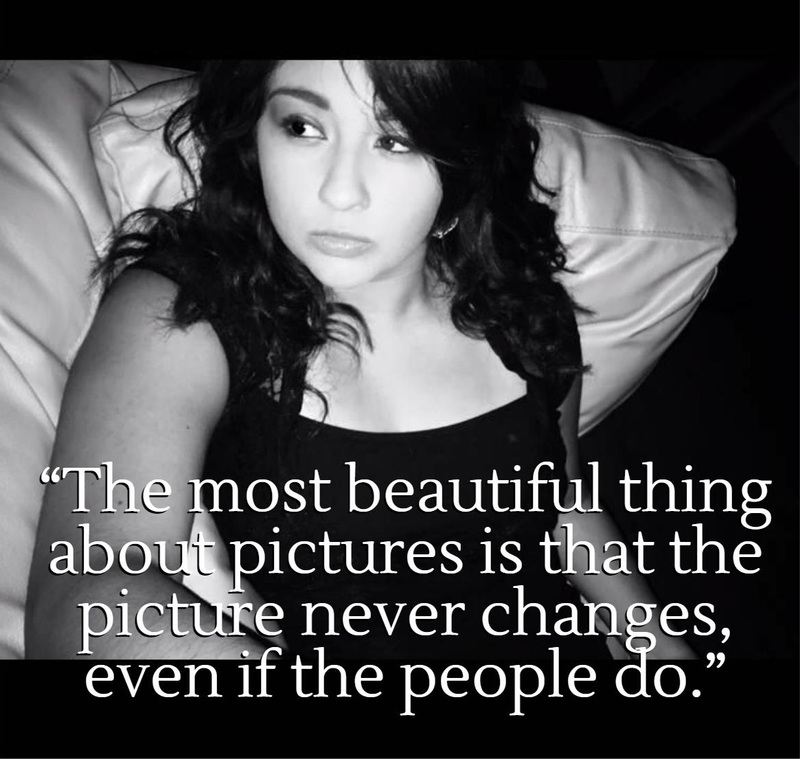 Pictures are memories, memories that will never change. I think that's something that impacts me the most. The fact that a picture memory always would stay the same. In that moment that picture was taken everything was okay. Even if the person changed, even if the person passed or someone's heart was broken. In that one moment a picture was taken everything was happy. 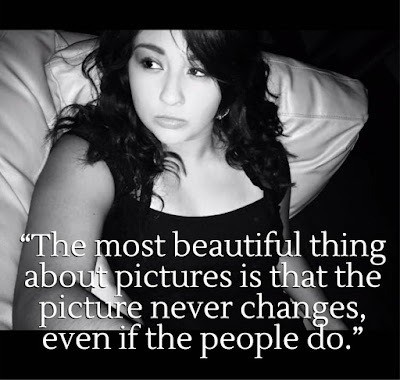 My favorite thing to say is "The most beautiful thing about pictures is that the picture never changes, even if the people do." What subjects do you photograph? What kind of images appeal to you most? 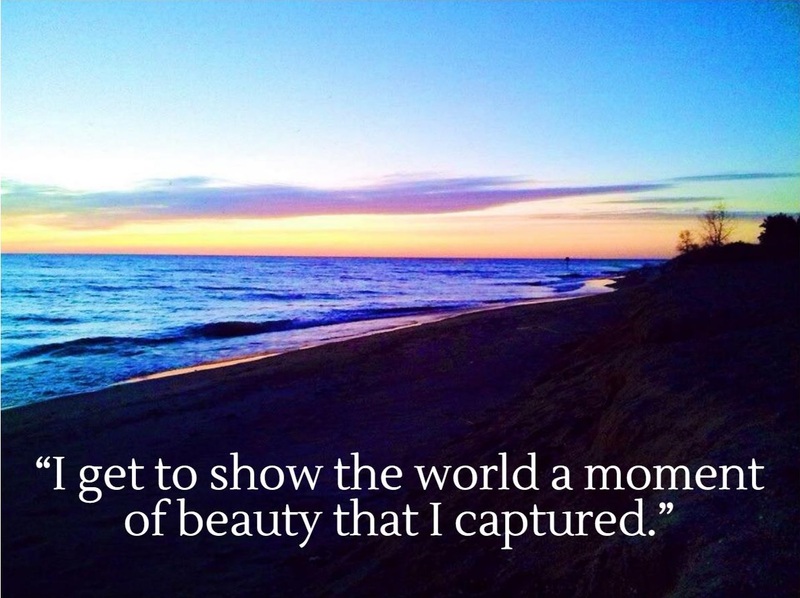 Personally I like to photograph scenery; abandoned places and beautiful sunrises. 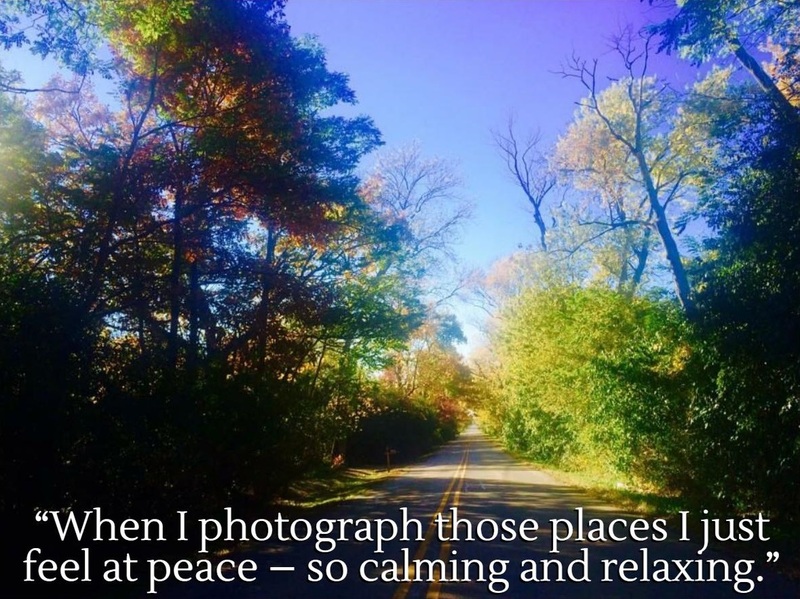 When I photograph those places I just feel at peace – so calming and relaxing. I love taking photographs of people and families and babies. I think the photographs that I've taken that appeal to me the most were of my best friend and her son. It was just the fact that you can see the love the mother has for her son. I think just the fact that one day that will be me [and] someone will be photographing me with my daughter or son or family – just the thought of getting to capture the special moments for someone else and knowing one day someone will be doing that for me is just beautiful. What has contributed to my success...I think is always believing in myself. There were definitely points where I was told being a photographer would get me nowhere, that it would be nothing, it was stupid, that I needed to think realistically. So I went back on what I wanted and went back to just saying, “You know what? Whatever, I'm going to be a nurse.” But it was just the fact that almost every friend I had – everyone I knew – wanted to be a nurse and I just know that wasn't me. That's not what I want to do. I wanted to do photography. I wanted to do something that I love. I wanted to be happy. So I stopped caring what everyone else said...and I just followed my heart and kept doing what I wanted to do. I think if I didn't believe in myself I wouldn't have gotten as far as I've gotten. So, believing in myself. Who inspires me? Now that's a tough one. It's not so much who, more so what inspires me. It's just to see people's reactions to the photographs I've taken or [seeing] them appreciate and love what I've done and how I've done their photos or working with them. I guess, basically just the people I photographed or the people that reach out to me and asked me to take pictures. I feel wanted, and I feel that when someone wants you to take their pictures or, you know, help them with a project or photograph their child it's just a good feeling to know that someone else likes your photos. Someone else likes what you do. It makes me happy. [I feel] inspired to keep doing what I do. 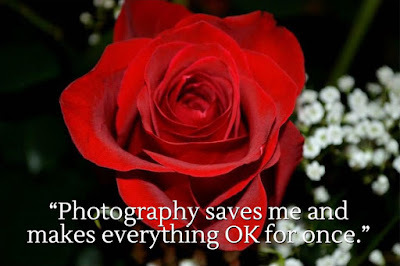 I love photography because it's a way to express myself and who I am. I get to show the world a moment of beauty that I captured. What's beautiful to me may or may not be beautiful to someone else but whatever I photograph, whatever I do with my pictures or my camera is me capturing what I think is beautiful; what I think is a memorable moment – [a] beautiful smile a loving couple or just capturing the moments for someone that's going to mean the world to them. I've always been a very creative person, [a] very colorful, outgoing, cheerful person and artistic, and photography just brings it all together for me. My friends are also big part of my photography. A few of them have let me photograph them and have helped me and I can show them and talk to them about it as much as I want. I work a lot. I work at Six Flags Great America and then I work at Victoria's Secret. I work a lot to pay for school. I am going to College of Lake County for teaching because I want to teach photography one day. I want to get my teaching degree and then continue studying at the Chicago Art Institute and get a photography degree. I also like to spend time with my best friends, my family [and] my little pug, Sparrow. I have multiple cameras. I have a Polaroid camera. I have [two] Canon film cameras (black-and-white) and then I have my Nikon digital. I'm not so much of a picky person with cameras because I feel any camera can capture an amazing photo, and also you shouldn't always depend on the camera: You should always depend on yourself and capturing the shot [and] focusing on your point. Are you thinking of publishing a coffee table book? I would write a book if I knew how to, but I don't. But if I did and I had to think of a title it would be "Photography Saved the Girl that Smiled." There is a part of me – a dark part of me...photography saves me and makes everything OK for once. I've just been through so much in about the last two years that photography has kept me happy...has made me smile and brought joy to me and is [the] only thing that won't let me down. I understand you have taken some photos of the characters who inspired my latest book, Bloodfeud: Vampires vs. Werewolves. Are any of these likely to appear on the book cover? I would hope that you would like to use my photos! 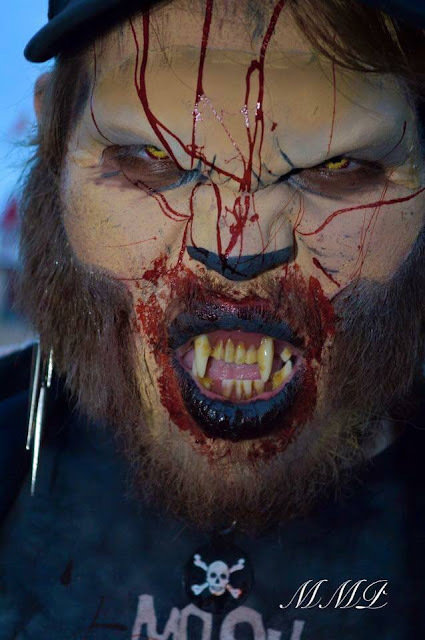 I am more than happy and available and open to obviously sharing any Fright Fest vampire/werewolf photos with you. I took many. Thanks, Melisa. And let me know if you want to get your photography book published. 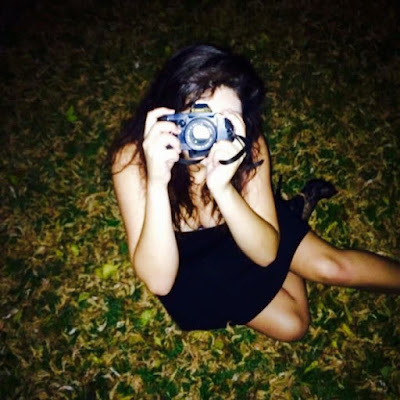 To see more of Melisa's work, check out her Facebook page, Melisa Mari Photography. If you'd like her to capture your special moment, send her an email at melisajasso at yahoo dot com. All photos in this article by Melisa Mari Abrego, who holds all rights to them. Photos used with permission. If you would like to be featured in Bruce's Babbling, CLICK HERE.